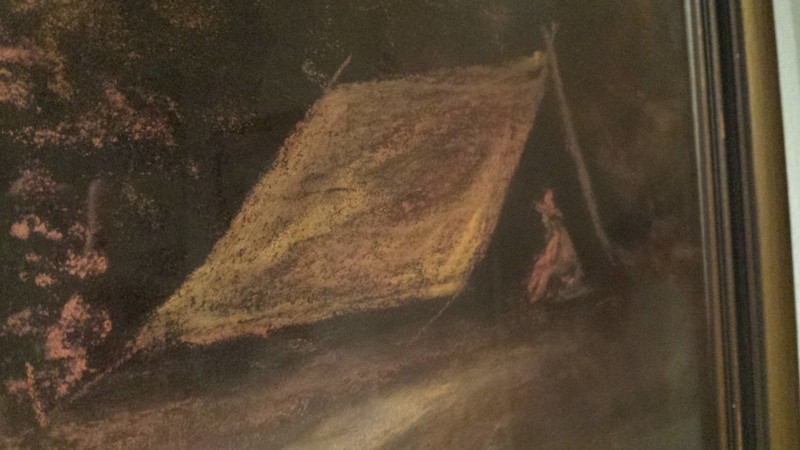 Judy Randolph sent me several photos of another campsite pastel with the signature of H.R. Lewis. Hubert Lewis had several landscapes that were painted with variations to their themes, and the campsite paintings exemplify this well. Judy went on to tell me that the Knights had received the pastel as a wedding gift. 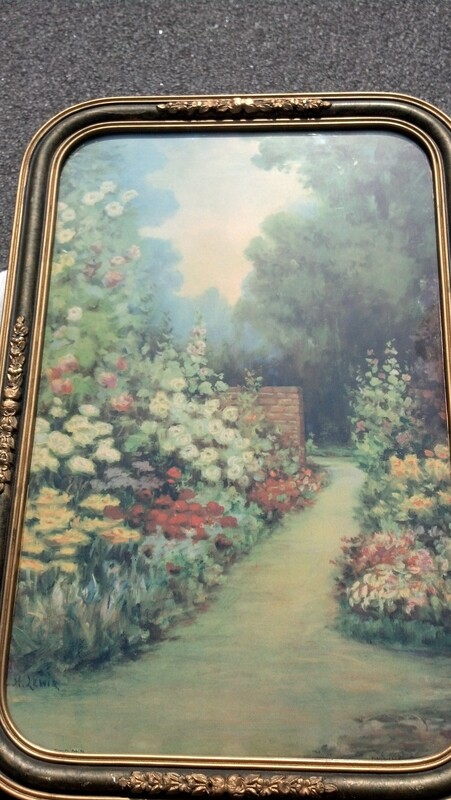 Since I knew my great grandfather had given several couple paintings as wedding gifts, I wondered if perhaps he had given this to the Knights, since they had lived in a suburb of Pittsburgh, PA. Judy was unable to verify if that was the case. 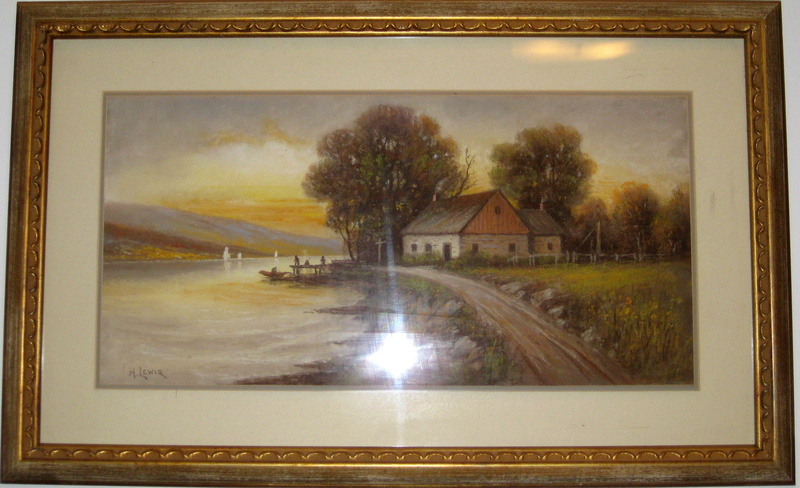 Judy’s father, Clyde Weissert is the current owner of the pastel. 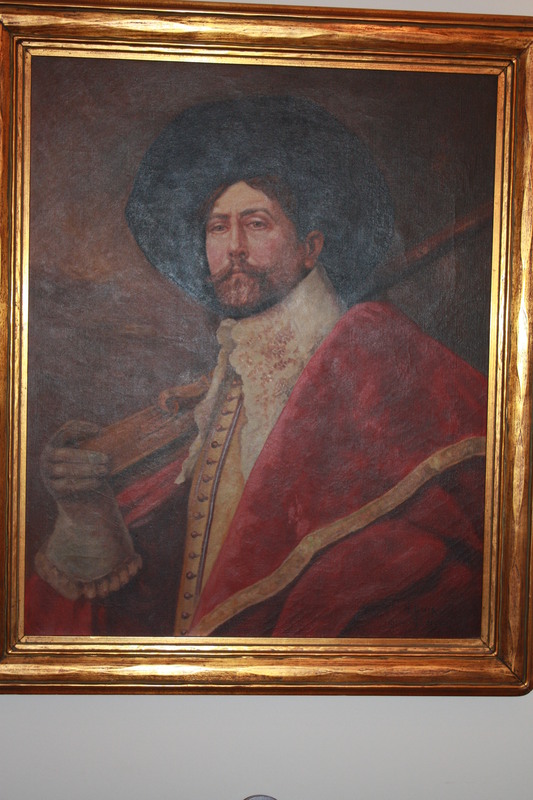 The painting was a gift to Mr. Weissert’s family from the Knights. As I mentioned in my book, R.A. Fox, too, painted a variation of the “Poppies”. All three of these artists– Lewis, Streckenbach (from Eckernforde), and Fox– lived and worked in about the same time period, so I do not know whose work was original and who emulated the works of the original. Perhaps there was yet another artist that all three replicated. If any one knows the answer to this question, I would love to hear it. I received an interesting email recently from Patricia Boyer. 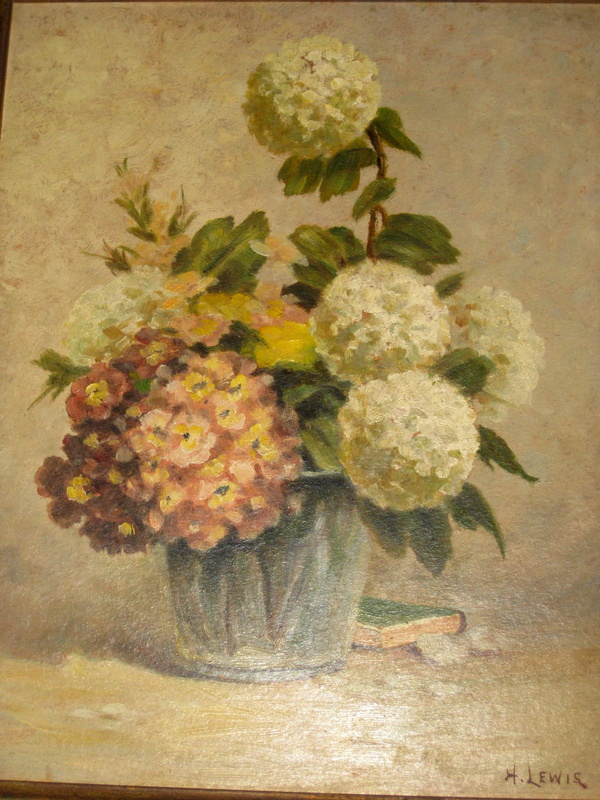 Patricia inherited two H. Lewis works, a chalk landscape and a floral oil painting. The pictures came from her parents, who had received the works as a wedding gift September 9, 1935 from an “H. Lewis”. It turns out Patricia’s father was a cousin to Marion Lewis Rosendahl. Marion was the daughter Harlof Rosendahl and of Garnet, Hubert’s daughter who died in the flu epidemic in 1918 just months after giving birth to Marion. Hubert and Sarah Lewis took baby Marion and her father Harlof in to their home after Garnet died. After some time, Harlof left Marion to be raised with the Lewis’s, her grandparents, as he went out to start his business in California. It would seem Hubert liked to give his art as wedding gifts, especially to those in the family. The gift to his granddaughter’s cousin was noteworthy in that it shows there was still a familial tie to Harlof’s side of the family 17 years after the death of Garnet. The newlyweds lived in Carlisle, PA, about 180 miles away from the Lewis’s. If my accounting is correct with my ancestry skills, I believe that Patricia and I are each first cousins once removed to Marion, but no relation to each other. We both learned some new things about Hubert Lewis and our respective families. 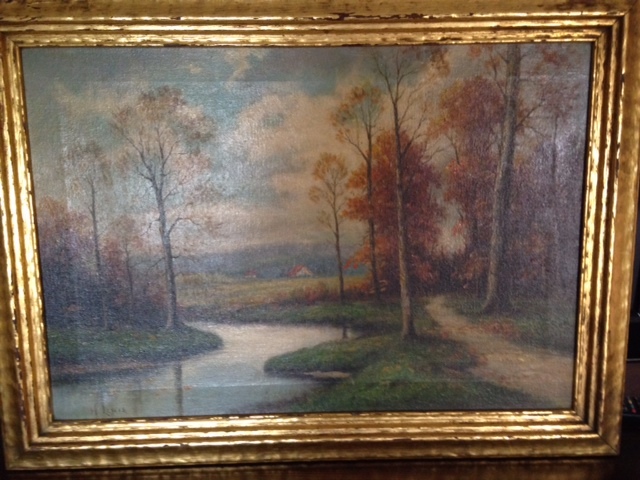 James Kazokas contacted me about a painting he won in an auction in Northfield, Massachusetts. 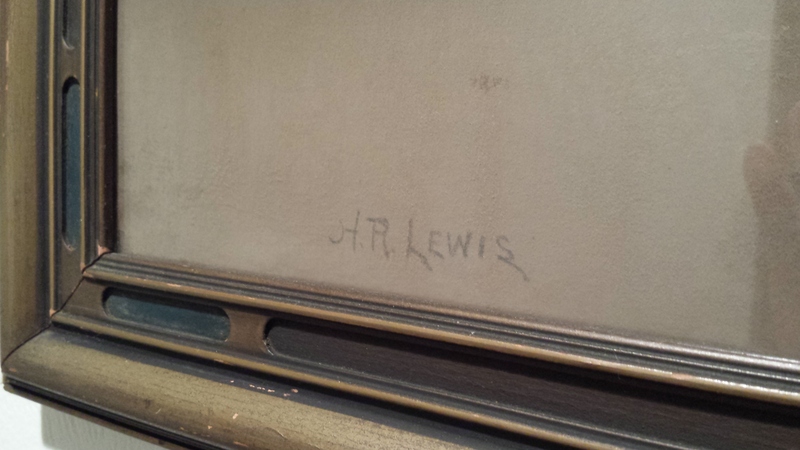 It bore the familiar signature of my great grandfather, Hubert Lewis. 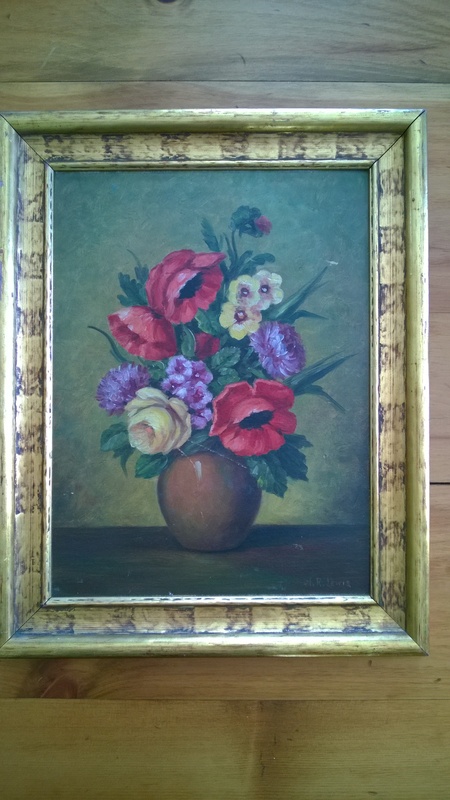 A bright floral, 12 inches by 16 inches, a little worn from time, has poppies in the bouquet, a flower painted often by Hubert. 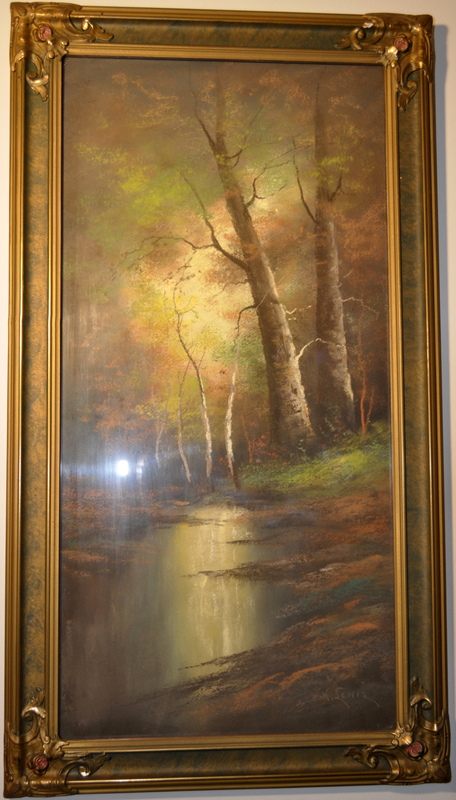 Kevin Shaw, from Cleveland, also contacted me to share two pastel landscapes, signed H. Lewis that were handed down to his wife and him from her father. His wife is originally from Pittsburgh, which is probably where her father acquired the pieces. It is a very pleasant evening landscape in a beautiful frame. The painting measures approximately 27 1/2 inches tall, and 13 1/2 inches wide. It is a lovely pastel. 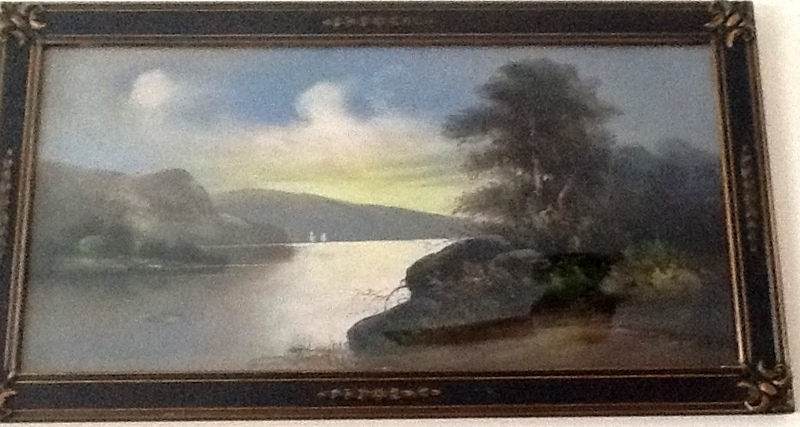 The Hubert Lewis pastel belonged to my wife’s late cousin who passed away in August of 2012 at the age of 94. We inherited the piece. 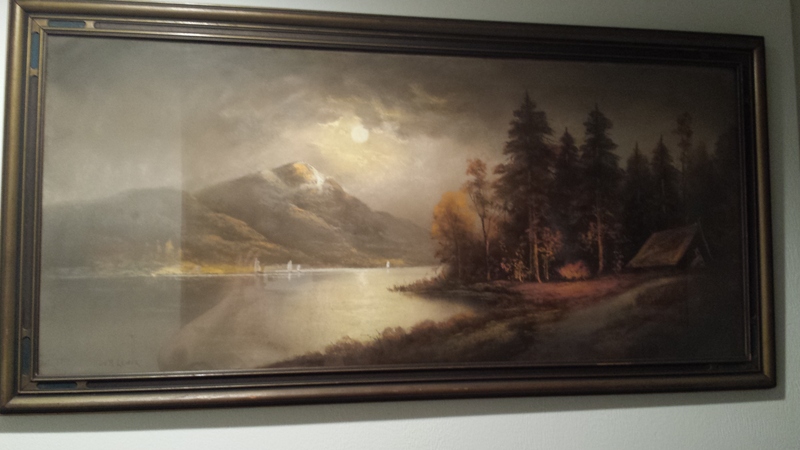 This particular piece we hold very dear to our hearts and is displayed on a prominent wall in our living room. The frame is beautiful. 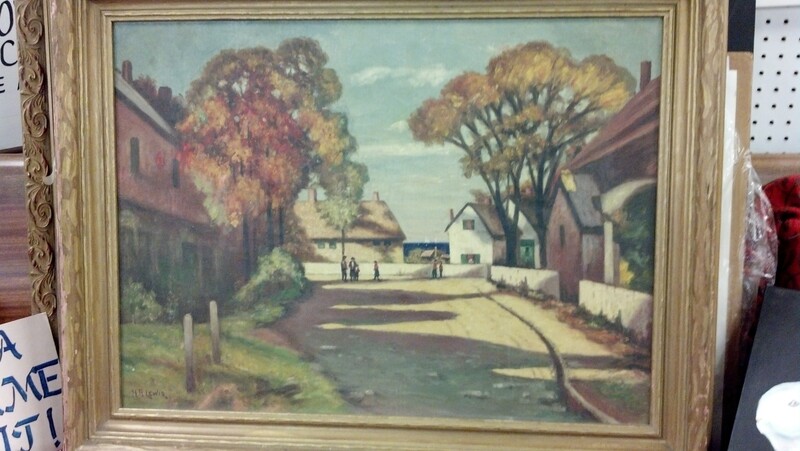 Hubert created many pastels and oils with simple scenes that were so beautiful in their simplicity. Some of his work is considered Hudson River School-like, though he was not considered a Hudson River School artist. We had two similar pastels in our home growing up, that now belong to my brother John. The signature you gave me is definitely Hubert Lewis’s although if you look at one then the other, you’ll see yours looks “peppier”. All the important parts are there, but there is more flair. 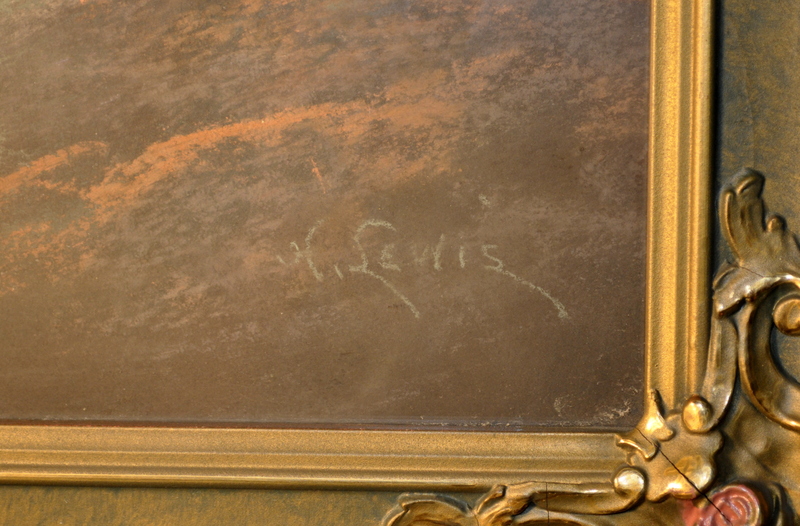 There are other known works of Hubert’s with signatures like your pastel has. Hubert listed his type of work as a framing company in one census, and I have ledgers showing he was paid by the same company that published his prints from the 1930’s-late 1940’s, Keystone Picture Frame Co. So he may have made that frame. It seems to me the original frames are unique. I can’t verify that, not having seen all his work, but they certainly each have their own personality. 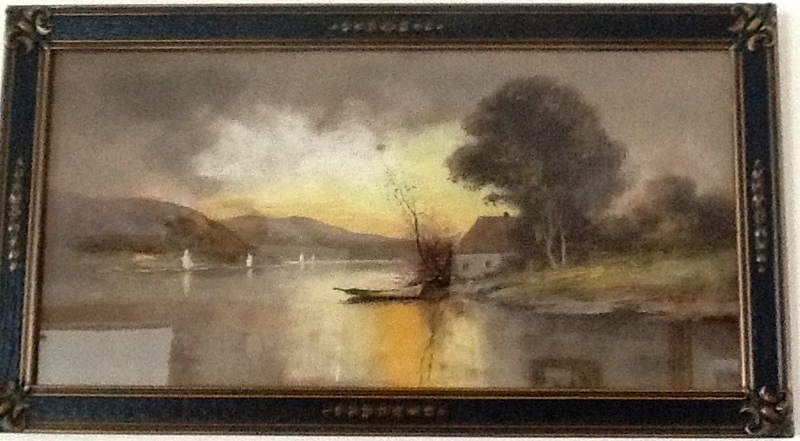 Possible Hubert Lewis painting with signature variation; will owners of known Hubert Lewis works please have a look? 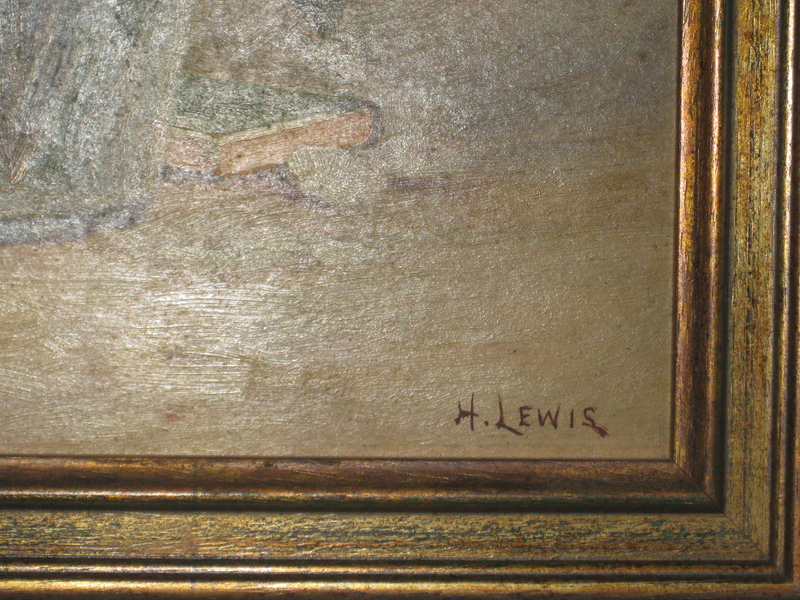 Diana Wolfe contacted me and sent photos of a painting and the signature, which looks like H. Lewis with the year 1921 written as well. The signature looks like it may have been written with a slightly broader brush, and there are similarities to Hubert’s known signatures, but differences as well. The “w” is much the same as many of his signatures. 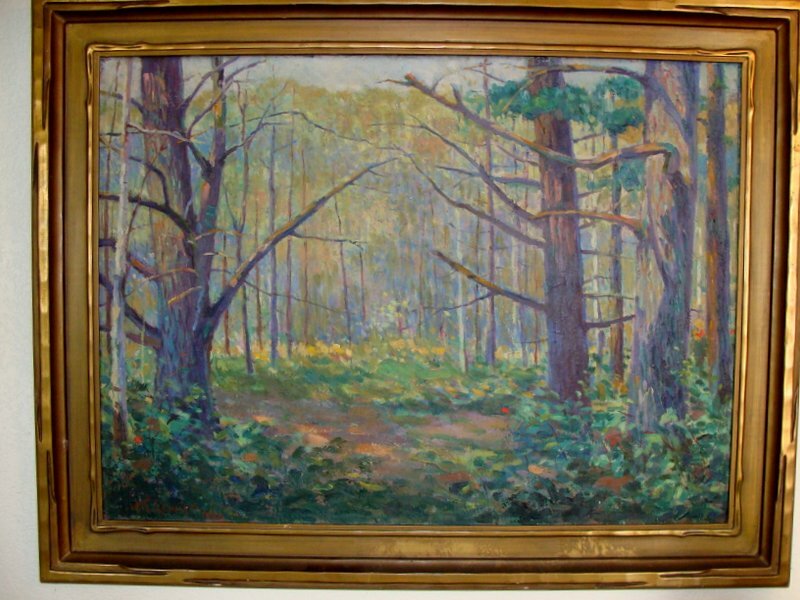 Hubert wrote the year on at least two paintings that I know of; my own Girl Playing the Piano and A Road through the Woods owned by Rob Stevenson. The “9” in 1921 looks much the same as the 9s the other two paintings. 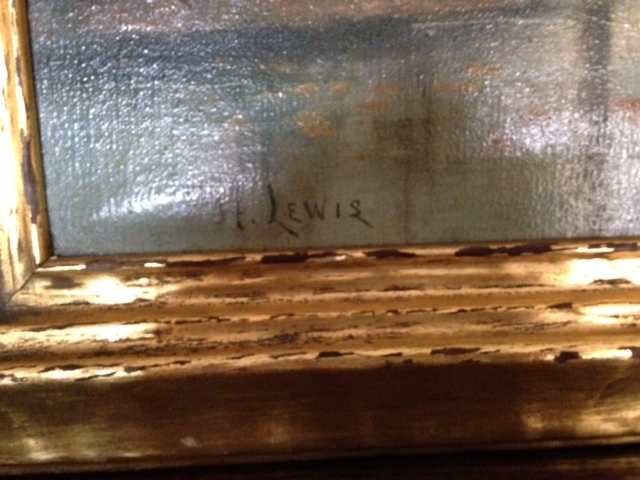 But the signature is also different enough that I can’t say I believe it is Hubert Lewis. The curved left side usual to his H is missing, the lengthened base on the L is not there, and the typical added tail of the s is also absent. This photo has been retouched to made the signature more readable. 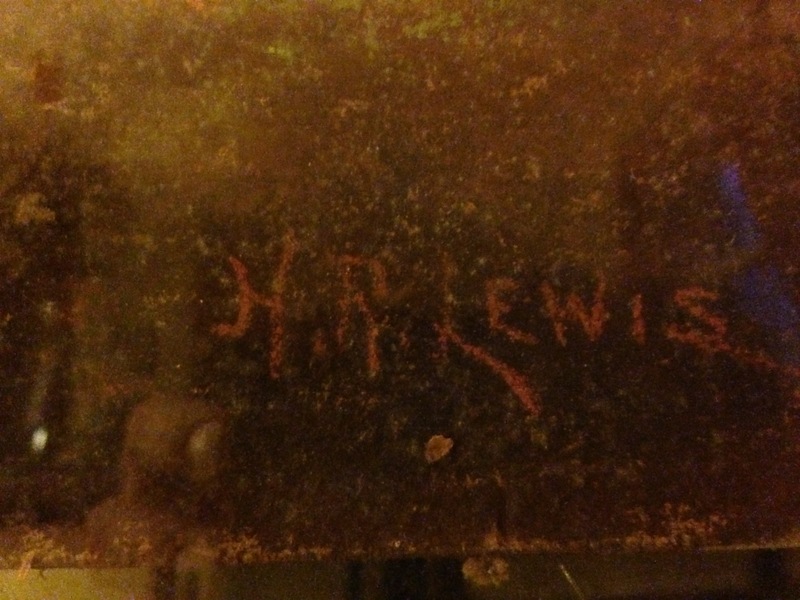 This is a photo of known signature of Hubert’s, signed in 1948, 27 years later. Hubert’s signature has varied over the years, but some aspects stayed fairly consistent. 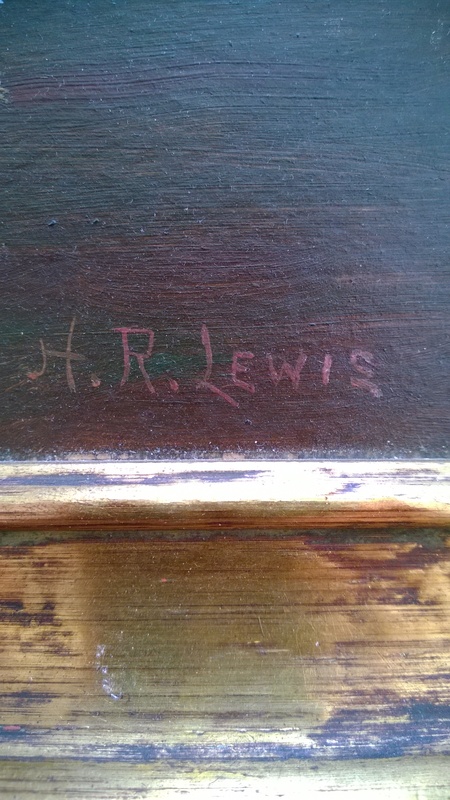 He has signed either H. Lewis or H. R. Lewis. The piece itself is a landscape. Hubert painted many landscapes, but this one does appear to be slightly different in style. I don’t know enough artistic lingo to describe how the landscape is different, however. Hubert had a few works that were also different than his usual style, so it may well be his. If anyone who has Hubert’s art recognizes this landscape or signature from one of his pieces, please send me a photo of work and the signature if you can, or let me know so I may let Diana know. I received a few emails from Cheryl Thiel, herself an artist and framer, who had just purchased a 22×30 oil painting from an auction house in North Carolina. She seemed so excited about her find, and told me she found a similar painting Autumn on my website page about my cousin Dale’s art, https://hlewisartist.com/2013/04/09/art-from-second-cousin-dale-and-her-mother/. Hey Kim….l am moving things around the shop today getting ready for a sale……was taking a piece l have always liked and did not want to sell, home……look at the signature! Published by Keystone. I love the frame on it! She had one of H Lewis’s prints by Keystone Publishing Company, much like one I own. 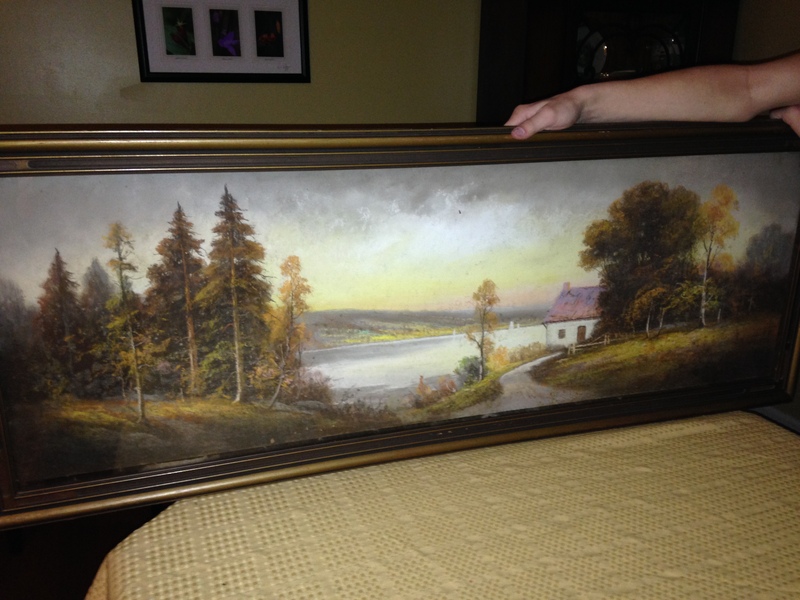 I came across your site while looking for some information on a painting that has been in my family for quite some time. 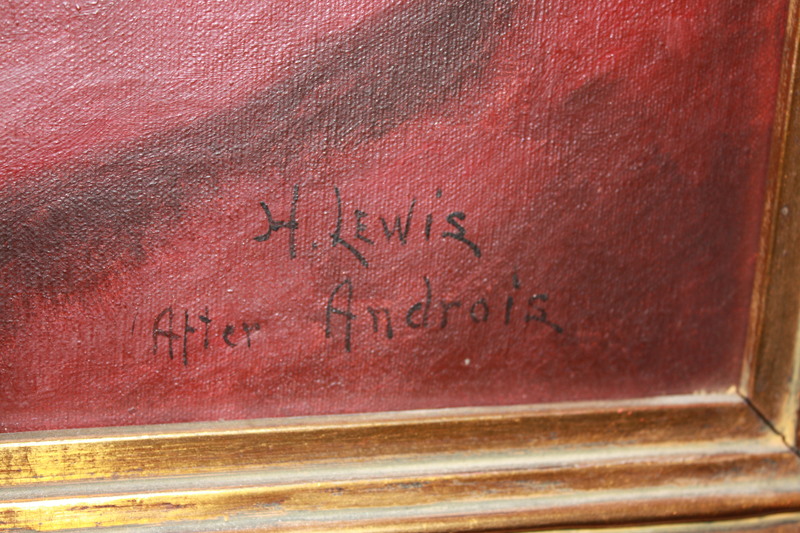 I’m unsure as to whether Hubert Lewis painted this and was hopeful that you might be able to help. This indeed looks like a painting by Hubert Lewis. 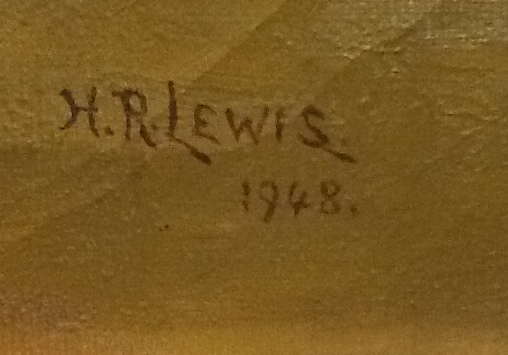 The interesting thing about this piece is that under his HR Lewis signature, he wrote the year. I have seen over 100 of his pieces now, and up till now I only knew of only one other that had the year written on it, and it is the “Girl Playing the Piano” that I own. This landscape is reminiscent of some of the other landscapes, but they are each unique in their own way as well. 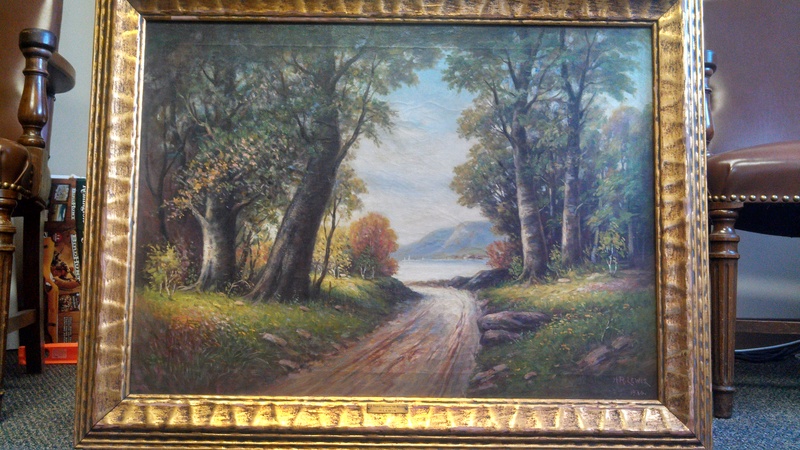 The year written on the painting appears to be either 1930 or 1936. Interestingly, given I’ve only seen a couple of works with the year written on it, I received an e-mail from Diana Wolfe that showed a painting with the year written on it as well. However I will post that painting in another post soon. Hubert Lewis the Artist:His Life, Family and Work now available on amazon.com!